‘Angelo’. 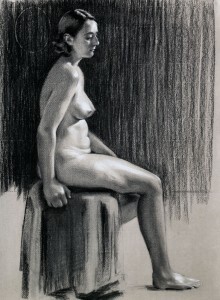 Charcoal on Roma paper, life size. For the second week at Sarum Studio, I stuck with charcoal as my medium. The figure was actually a two week project which was started last week, and represents approx. 20 hours of work. It was great to have the time to gently practise control over modelling, making adjustments here and there. It is still not as highly rendered as it could be with even more work, but I only want to concentrate on finish up to a point. I personally prefer drawings that retain some freshness, perhaps (in the words of Harold Speed) ‘dither’ in the expression. Overall, the drawing is accurate, but I could have given a little more flow to the posture and feminised the hand some more. I like the work in the thigh area though, and think it subtly conveys a sense of flesh and weight. The portrait, ‘Angelo’, was a week’s work of around 10 hours. While I still need a lot of practise in refining my use of charcoal, I am pleased with the likeness and characterisation achieved. Not least because this was quite a difficult portrait to lock-in, as the light and shade provided little definition to get hold of. This was a particular problem in shaping the nose and working out exactly how other features, such as the corner of the mouth and far eye, were positioned against it. A few minor tweaks and flourishes aside, I managed to capture the sitter very well. My only regret is that I left modelling the ear to the last 5 minutes and ran out of time, so what is there is rather basic and in need of knocking into shape somewhat. It’s not too bad though, and isn’t intended to be a focal point, so I think it works (as long as it isn’t studied too closely). I like to think of it as a good example of essential selection and not giving the same level of detail and finish to all features. This is a key lesson of naturalistic drawing and painting – although admittedly, a little more finish in this case would have been preferable. Note: Frank W. Benson (March 24, 1862 – November 15, 1951) was an American ‘Boston School’ artist. 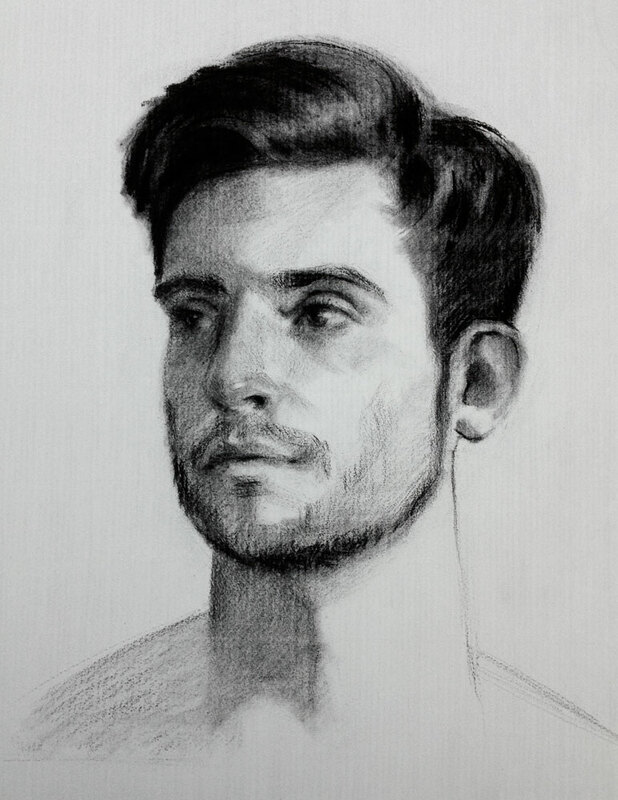 Really lovely work, it is refreshing to back into charcoal after lots of painting. Thanks Jen, I’ve really enjoyed working with charcoal again. Back with painting this week, but will try not to leave it so long before getting back to more charcoal work. Looking forward to seeing the results of your plein air trip to Wexford. Very exciting! Thanks Helen I’ve Just had a read of the Frank Benson article, very very good. It touches on what we were discussing about more meaningful work, but we agreed that an obvious message wasn’t it. As Frank says is about design, I think this is what I want in my work, an accurate and even sensitive rendition of what is in front of me is not enough, I want my work to be DESIGNED!